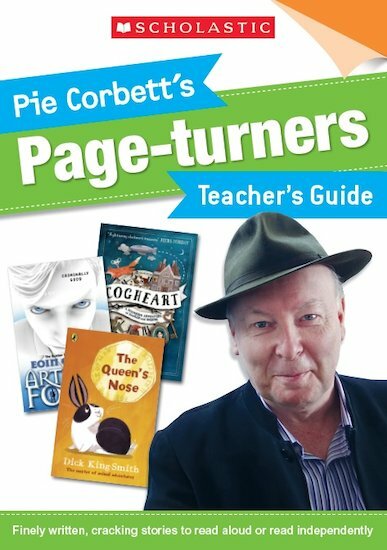 Pie Corbett’s Page-Turners is a new collection of exciting reads by top authors, specially selected for sharing with your class. These best-loved books practise the core reading habits developed in Pie Corbett’s Reading Spine, while promoting independent reading and reading for pleasure. Now you can get even more from the Page-Turners with this handy teacher’s guide, bursting with innovative ways to explore Pie’s chosen books in your classroom. It includes top tips for reading aloud with children and comprehensive teacher’s notes for every chosen book for Years 3-6, as well as ideas for using the books to teach essential English skills including comprehension, writing and drama. You can buy the Page-Turners children’s books in our handy packs ranged by year group. They are also available individually and in sets of six and 30.